The Duo Door is a metal clad door with a smaller auxiliary door and flyscreen within the primary door. When open, the auxiliary door provides light and ventilation, and whilst in the open position the primary door will open and close freely. The Duo Door incorporates the Rebate Edge overlap and PVC seal to all four edges of the door. 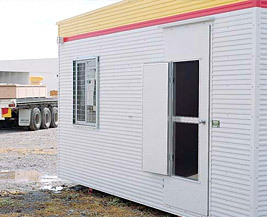 Standard Duo Doors are manufactured using flat pre painted Colorbond steel or optional Diamond Embossed Colorbond steel. The Diamond Embossed finish provides a unique look and extra strength to the door surface. The internal is a rigid polystyrene solid core. The auxiliary door secures via a turn-snib into an extruded aluminium frame which has a PVC seal fitted for dust and weather protection. Timber blocks are internally fitted to accept the required locking and hardware. Although generally used in an open out application, open in doors are available. 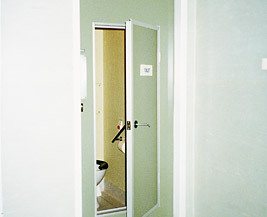 The Duo Door is also available in Squareline configuration. The Rebate Edge Door standard surface finish is pre-painted flat Colorbond steel. Also available in Zincalume, Galvabond, aluminium or stainless steel. Powdercoat finish is not available to Rebate Edge Duo Doors. Door shall be a Lietzke Duo Door with Rebate Edge (or Squareline)* configuration and is to include auxiliary door with edge seals, turn-snib and flyscreen. The door shall be pre-hung in a Lietzke Flange Fit or (BW Series)* Frame and pre-fitted with the locks and hardware as specified.